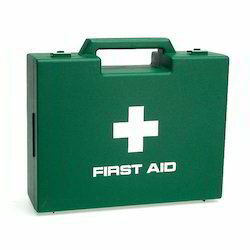 Prominent & Leading Manufacturer from Secunderabad, we offer first aid boxes. We are engaged in offering a wide range of First Aid Boxes. These are available with us in various range and dimensions as per the specific demands of clients. Our products are manufactured using top quality components and using advance techniques. Owing to its optimum quality and effective usage, these first aid boxes are extensively recommended by various numbers of clients.